Cuba is one of our favorite countries and one we cannot recommend enough to other travelers. 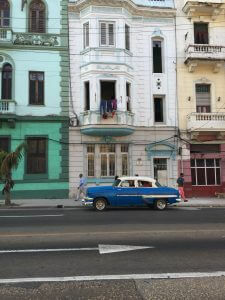 Traveling to Cuba is an authentic experience, budget friendly, and easy to do, even though many people believe you can’t go to Cuba. The island of Cuba is massive compared to others in the Caribbean. 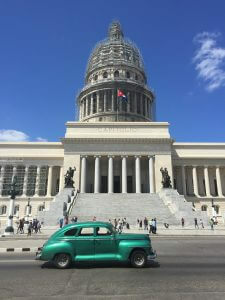 This, along with the fact that Cuba remains a mystery to most Americans, can make planning a trip to Cuba seem daunting. Don’t worry! We’ve got you covered with a great one week itinerary for Cuba. Before we start with the itinerary, it’s important to say that Cuba is very easy to travel to for Americans. Check out our guide on How to Go to Cuba as an American. This explains everything from how to exchange money for Cuba to where to stay, to how to get around Cuba. During this one week trip to Cuba, you’ll be in Havana twice—staring and ending your trip. We recommend that you stay in two different neighborhoods of the Cuban capital in order to better explore it. Start your trip in the Vedado neighborhood of Havana. Most of Havana’s visitors go immediately for Old Havana and stay there. 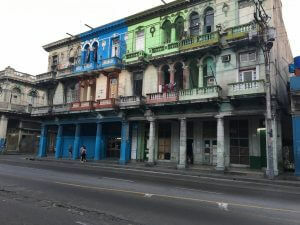 While this is fun (we’ll get to Old Havana later), Vedado gives you the opportunity to see a different side of Havana. There’s plenty to do with the university being nearby and Old Havana isn’t far away at all. We stayed in Hostel Caissa, a small, family-run hostel. However, there are plenty of casas particulares or Airbnbs where you could stay in that area too. The food is also significantly cheaper in Vedado. We had a full dinner for $3-4 a piece. This can be a real help with the budgeting for Cuba. When looking at where to eat in Vedado, check out Locos Por Cuba and this one really good hole-in-the-wall restaurant on the corner of Espada and Neptuno. If you want to get a real Cuban food experience, pick a place that looks like it is in the street level of a house. These tend to be more family run restaurants. Take this first day, depending on when you get in of course, to walk around Vedado, get some delicious Cuban food, explore the University, and walk along the Malecón. Explore Vedado some more your second day because you’ll be leaving early for Viñales tomorrow. Walk along Avenida 23 away from the Malecón to see some outstanding architecture and some really nice homes. If you’re going on the Support for the Cuban People Visa, we recommend doing some sort of tour or experience with locals. It’ll help satisfy your visa requirements, plus our’s were amazing experiences that gave us a better understanding and appreciation for Cuban history and life. 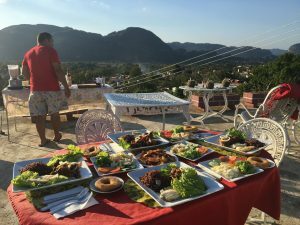 We did a Cuban Food and Culture Tour through Airbnb Experiences—our first time using it. 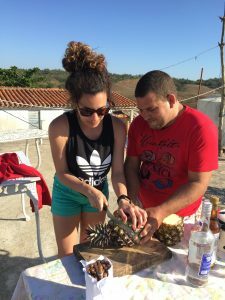 It’s run by a husband and wife who take you around Vedado, tell you about the Cuban culture and the country’s history, while taking you to a bar, restaurant, and cafe, that you might not find otherwise. 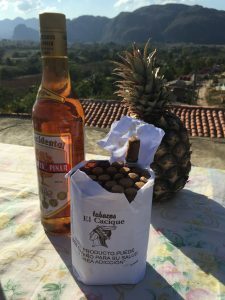 This was one of the top highlights of our week in Cuba, and we only included the link here because it was such a wonderful experience. Take a shared taxi from Havana to Viñales. The taxi will pick you up around 8:00 a.m. and drop you off in Viñales around noon. Most airbnbs/hostels/casas particulares can help you arrange a shared taxi. Grab a snack in the car the day before because even though they’ll make one stop at a gas station, you might get hungry on the way. It will drop you off right where you’re staying or wherever you’d like to be dropped off in Viñales. The door-to-door service is a benefit to the taxis in Cuba over the bus. In Viñales, you can go horseback riding, hiking, visit a tobacco field, or just relax and enjoy the countryside. Coming from Havana, the laid-back vibe might be welcoming for some. Seeing as though you arrive around noon, we recommend walking through Viñales and grabbing some lunch. 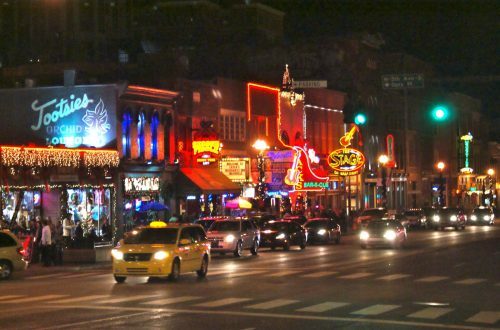 There are quite a few restaurants and bars right on the main street. After eating lunch, stroll through the city before having dinner with Yordanis at his Dinner and Cocktails While the Sun Sets. 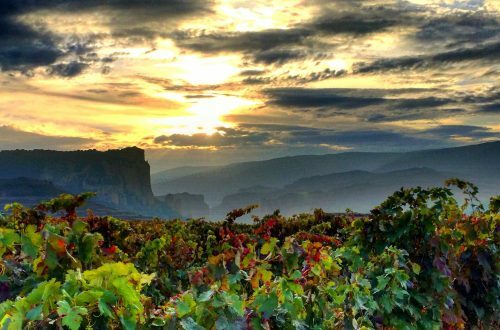 This is another Airbnb Experience that far surpassed our expectations. Yordanis’ house has a wonderful view—probably the best in Viñales—of all of Viñales and the whole valley. It’s the perfect place to watch the sunset, especially because you’re on his rooftop. It doesn’t stop there either! He makes cocktails with you and lets you add extra rum if you want. There are also Cuban cigars to smoke and a full dinner which will leave you stuffed. All-in-all, we couldn’t recommend this Airbnb Experience enough. The second day in Viñales can be more packed with activities since you already saw all of Viñales the first day. We went horseback riding and visited tobacco farm where Cuban cigars are made. You can also go hiking in the Viñales Valley National Park. We’d recommend that you at least visit a tobacco farm, but whichever activity you chose to do, you can’t go wrong. Return to Havana the morning of Day 5. The taxi will leave Viñales around 8:00 a.m. and get to Havana around noon. This time, stay around Old Havana or close to the Capitol in Havana. We stayed just west of the Capitol. It was significantly cheaper than staying in Old Havana, but there was more going on in Old Havana. It was only a short walk there though. Here’s the place we stayed in Havana near the Capitol. Freddy was an outstanding host that helped us a lot! 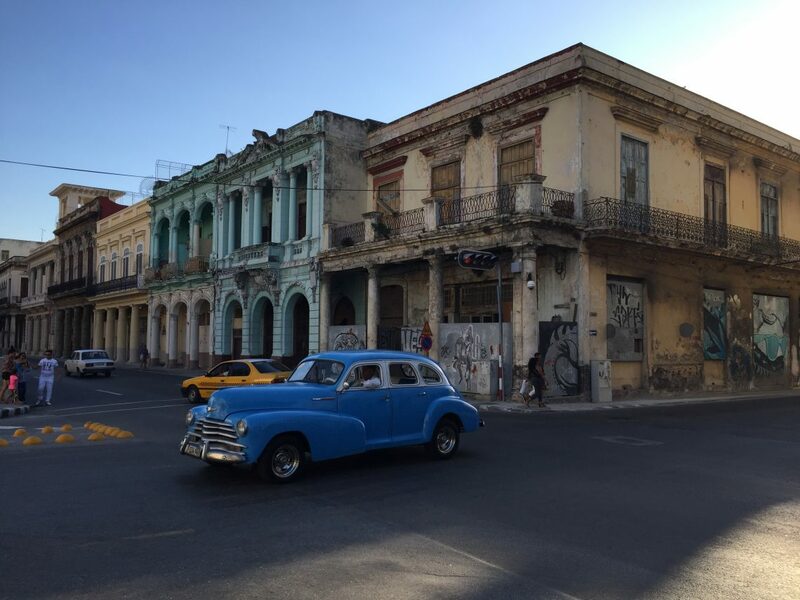 Explore Old Havana now that you’re staying in that area. There’s plenty to do, eat, and drink in Old Havana. Try to find some live music too. 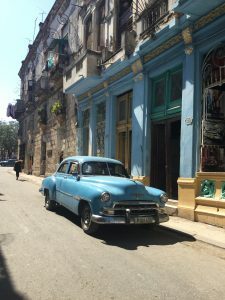 There’s also the option of a tour of Havana in a classic car or salsa lessons, both of which are worth it. We recommend finding time for at least one of them. Do one this day depending on when your flight is on Day 7. If you have time on your last day, you can do one of these activities then too. If you’re craving the beach and simply cannot wait until (spoiler alert) tomorrow. You can take a taxi to Playa Del Este, which is about a 20-minute taxi ride east of Havana. The beach is pretty nice, close to Havana, and where a lot of locals go. This is definitely an option if you’re craving the beach after 4 days on being on a Caribbean island and not going to the beach. If you’re up for a night out in Havana, the best place to go is La Fabrica del Arte Cubano (FAC). It’s an old factory that has been converted into a huge art gallery/bar/club/nightlife hotspot. La Fabrica del Arte Cubano is the place to go out at night in Havana, and we cannot recommend it enough. 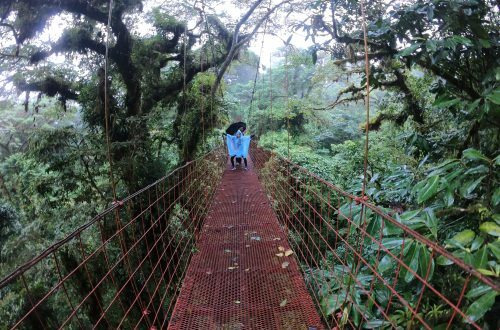 It’s unlike any place we’ve been before and truly has an atmosphere of its own. Entrance is $10, and get there a little early because they will sell out and stop admitting people. 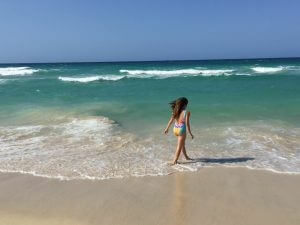 You’ll still be staying in Havana for Day 6, but you go to Varadero, the best beach in Cuba, for the day. We decided on a tour for an all-inclusive beach day in Varadero. This included transportation to and from Havana, breakfast, lunch and all you can drink services. They also had a hotel room available to use if needed. The day at the beach was from about 9 a.m. to 5 p.m. This is a great relaxing way to spend a day in Cuba. It helped that the beach was incredible too. The water was warm. There were hardly any clouds in the sky, and it was really nice to just relax and enjoy ourselves instead of trying to navigate all the time. If a beach day isn’t something you’re interested in, we recommend checking out Old Havana some more and maybe taking a peek at some museums around Havana. Your last day in Cuba will be dependent on when your flight departs. We recommend that you take a salsa class or a tour of Havana in a classic car. This will take most of your morning and then you can easily get to the airport by taxi for your flight. Although, maybe you want to miss it and stay in Cuba! We were certainly sad to leave! 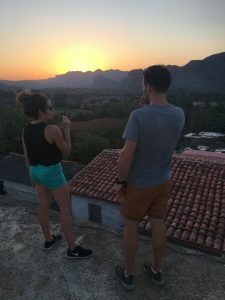 Again, if you’re looking for how to travel to Cuba, here’s our guide How to Go to Cuba as an American. 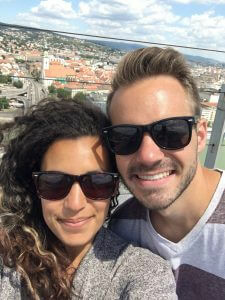 It includes everything you’ll need to know, including your visa, exchanging money, and transportation within Cuba. We also have a list of 10 Do’s and Don’ts for Traveling to Cuba, so you won’t run into any problems while you’re there. What recommendations do you have for a one week itinerary in Cuba? Thanks for reading! We’re glad we could help you out!